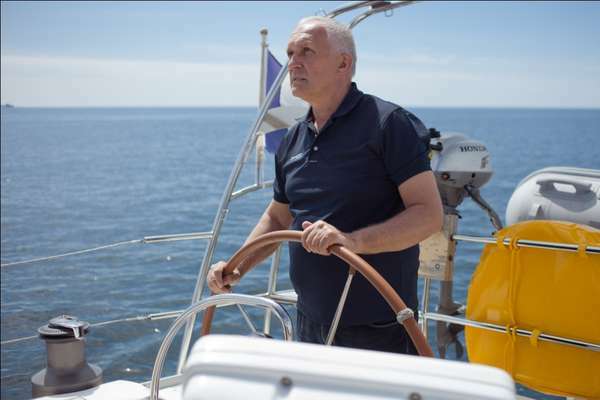 Wojciech Kot, co-owner of the Delphia Yachts Kot Sp.j. company, the largest producer of sailing yachts in Poland, talks to Magdalena ¸asak. Your brand is recognizable around the world. What is the secret of your success? Both my brother and I are sailors and hold a skipper’s license. Our company employs around ten marine helmsmen, a dozen or so yacht helmsmen and over 100 sailors. Our staff sail all the time. We mainly work within our own community, by which I mean the Olecko area where our yacht yard is located. This is where our managerial staff and a dozen or so engineers come from. We had a clear goal from the beginning, but we never expected to achieve such a strong position on the market. I must say that throughout our company’s history, there was never a single bad idea. For example, when we planned our production, we chose to have modern buildings. We built innovative buildings 15 years ago that can be enlarged and upgraded. The halls are safe, easy to modernize and our production lines are easily modifiable. We also chose the best dealers out there and started working with Hubert Jab∏oƒski of Sportina Yachts who is now the general importer. After the 21 years that the company has been around, I can say that solid foundations, including the right decisions, good planning and efficient management have contributed to our success. And then there is hard work. They are top management, that is, active people, many of them from the liberal professions, who can afford a hobby like this. They are passionate about sailing. We have been watching the customer market develop and we can see that at present even people in their 20s can afford to buy a yacht. We have buyers across Poland and we also sell yachts abroad, mostly to Scandinavia. Your company has produced almost 3,000 yachts. What are your plans for the coming years? Our future plans are tied with the company’s policy regarding both production and maintaining our dealership chain, mostly in German-speaking countries, the Netherlands and Russia. We want to make sure our dealers have something to sell. We know what the demand is. At this year’s Wind and Water Fair, we unveiled our two new yachts, the Delphia 31 sailing yacht and a new motor yacht called the Delphia 800 Escape. The Delphia 31 marks the start of an entire line which ends with the Delphia 47, a great and highly popular yacht with a different look. We believe there is room for five other models between the two and we want to put them on the market within twoand-a-half years. They will form one line, one family of modern yachts.